Woodcut and citation within elaborate border. Poem on verso. 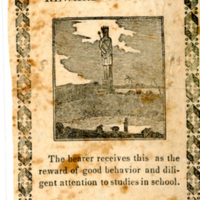 Removed from "Scholar's pocket companion" printed in Windsor, Vt., 1809.